Perhaps some readers have seen re-runs of the old 1980's television hit show "Murder, She Wrote" which was broadcast for an impressive 12 seasons from 1984-1996, and won countless awards along the way. The show starred actress Angela Lansbury who played the main character Jessica Fletcher, and Mrs. Fletcher was a mystery writer. Coincidentally, Ms. Lansbury's hit TV show emerged at roughly the same time as her very good friend Bea Arthur who also had a hit TV series called "The Golden Girls" which aired from 1985-1992 and was another show that featured more mature women as the central characters (I've addressed that show HERE). The two actresses met one another when they co-starred in the Broadway musical "Mame" in 1966 (both women won Tony Awards that year), and they remained lifelong friends until Ms. Arthur passed away in 2009. The opening of "Murder, She Wrote" featured the character Mrs. Fletcher producing a murder-mystery manuscript on a vintage typewriter, at least until Jessica got with the times and started using a word processor during last few seasons of the show which were recorded in the 1990's. In any event, the idea of authors (and non-authors) using old, mechanical typewriters is hardly fiction. For example, it's been reported that actor and producer Tom Hanks is a very big collector of vintage typewriters. In 2013, he wrote an ode to the vintage typewriter published in the New York Times (see https://nyti.ms/2Q78O5D for his piece). On October 15, 2017, he told "CBS Sunday Morning" that a book he released entitled "Uncommon Type" was a collection of 17 short stories in which typewriters were supporting characters, and that was entirely on purpose he says. See the transcript of the segment featuring his typewriters and him at https://www.cbsnews.com/news/tom-hanks-uncommon-type/ and the video at https://www.cbs.com/shows/cbs-sunday-morning/video/MfE6Mrff_TwfGuZQmEZ3wgy9CG_3w16Z/tom-hanks-typewriter-enthusiast/ (or on YouTube at https://youtu.be/UTtDb73NkNM if you wish). CBS Sunday Morning observed "Funny that a guy who's name is synonymous with "You've Got Mail" [the 1998 film Mr. Hanks starred in, along with Meg Ryan] loves something even more vintage than AOL itself." Mr. Hanks' personal typewriter collection is reportedly now more than 100 vintage typewriters, most having been completely restored to beautiful, working condition and before he passed away, CBS News' Morley Safer brought his typewriter to one store Mr. Hanks frequents -- at least, so said the index card on file at Gramercy Typewriter in New York City, a business that restores and sells vintage typewriters which has seen a booming business in recent years. 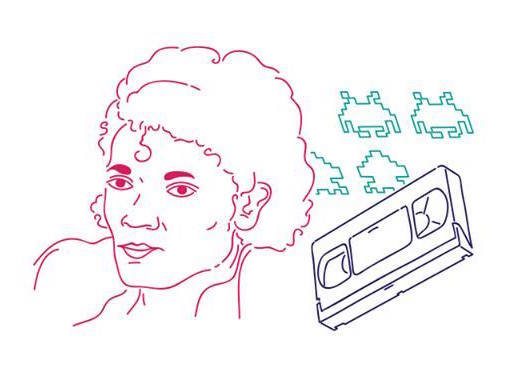 The reasons for their newfound popularity are varied, but many writers say its because the machines were an integral part of the creative process. Tom Hanks said "There's a percussive quality to writing sometimes, you know?" But Tom Hanks may be a good public persona representing what is undoubtedly a national trend. Indeed, all across the country, many sellers of reconditioned, old typewriters are reporting a very robust business, with some like Gramercy in NYC even gaining prominent national news coverage. The trend has even spawned a new business of selling typewriter-like modern keyboards and even retrofitting old typewriters to function as a modern-day computer keyboards. Its worth mentioning that the original 1874 Sholes & Glidden typewriters established the "QWERTY" layout for the letter keys and the QWERTY layout of keys has become the de facto standard for English-language typewriter and computer keyboards, including many found on touch-screen keyboards in mobile phones and tablets used even today. Other languages written in the Latin alphabet sometimes use variants of the QWERTY layouts, such as the French AZERTY, the Italian QZERTY and the German QWERTZ layouts. Hence, the lasting legacy of old typewriters remain very much with us even today. A fair number of accomplished writers, in spite of the advent of modern-day word processing which has made manuscript revisions and corrections far easier, still had a fondness for manual typewriters. As noted, many explain it as being an integral part of their creative process. The unique feel of tapping the keys, and the sounds associated with manual typewriters are part of it, and many writers were reluctant to completely abandon that aspect of the creative process. That said, there is still no denying the unique advantages of word processing programs, such as the ability to incorporate many revisions easily and produce a perfectly printed hard-copies with said revisions in just minutes. To address the fondness for not-so-new technology that so many rely upon, the market has responded. For example, a typewriter-inspired mechanical keyboard called the Qwerkywriter Bluetooth keyboard was an unexpected Kickstarter success story in 2015, and it has seen some commercial success. In essence, it enables the use of modern, tablet computers much like an old-fashioned, manual typewriter. Bustle featured an article on the topic at https://www.bustle.com/articles/59728-5-typewriters-and-typewriter-ish-apps-that-are-fit-for-21st-century-writers-to-compose-their-masterpieces which is worth reading. 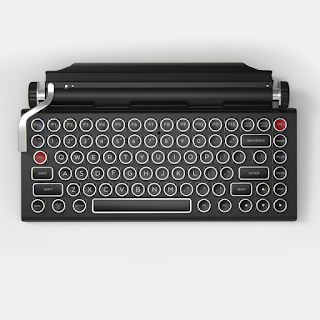 In the original pitch, the Qwerkywriter was proposed to come with both USB and Bluetooth connections, but only the latter made it into the final version. Some early complaints about the Qwerkywriter keyboard were that the tablet dock made it kind of difficult for users to actually read what they were typing, and some Apple fans complained their home keys were blocked in the initial version (Android users had similar issues). However, most of those issues have since been successfully addressed, and users find these retro-styled keyboards pleasingly heavy, weighing several pounds so they do not slide around one's desktop, and are made from solid aluminum that's covered in a matte black powder paint, similar to many old typewriters. Apps enabling vintage typewriter sound-effects are also available (Tom Hanks had something to do with one app called Hanx Writer, too!). A recording of the sound of typing on a Smith-Corona electric typewriter (visit HERE for the source page) can be listened to below. 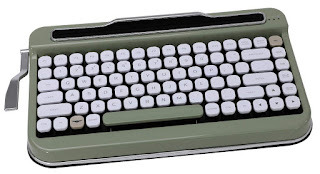 Naturally, the successful idea inspired a number of knockoffs, including some significantly cheaper versions, and while the Qwerkywriter and rivals including the Azio retro classic computer keyboard, the Elretron PENNA keyboard cost several hundred dollars, some cheap knockoffs made in China, including a few models from Logitech, can be found for as little as $35, although the cheap knockoffs aren't nearly as sturdy/heavy so they don't feel as solid to use, and critics say you get what you pay for. 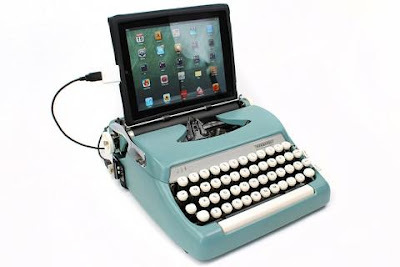 While the manufactures promote the idea of using their keyboards with smartphones, the idea of watching a tiny screen is lost on many would-be buyers, most of whom find tablet computers far more compelling, but if kids will fork over $300 to use a typewriter keyboard with an iPhone, I guess they won't complain too much. Meanwhile, other companies including the USB Typewriter offer conversion kits to actually retrofit old vintage typewriters to function as virtual keyboards that will work with iPad, Android, Microsoft Surface tablet computers as well as PC's and Macs, which not only address the limited Bluetooth connectivity with a USB connection (they also sell retro-fitted old typewriters as keyboards), but the conversion kits also enable trusted old typewriters that users are very comfortable with to continue functioning, only with newer capabilities. Even a startup with the old Royal Typewriter name has since gotten into the space. In some respects, these are just different variations on the theme of retro themed landline phone services via the internet through providers like Vonage, Ooma and Google Voice/Obihai-Polycom did by enabling low-cost computer VoIP calling among households to go mainstream, no longer exclusively limited to big corporate buyers (catch my post on that topic HERE). That technology, specifically VoIP-enabled calling is far bigger than old analog PBX systems were and yes, bigger than smartphones, plus its cheaper. The reality is that the landline telephone isn't dead no matter what Apple or Samsung would have us believe, although it's no longer the central means of communications with the outside world among all households. So are the retro-styled keyboards a genuine restoration of the creative process facilitated by older technology, or is it merely an expensive gadget for a generation unfamiliar with the older technologies? The answer is perhaps a little of both. Whether these inspire creativity the manual typewriter did for generations of writers remains to be seen.